Desktop karaoke application OSD-Lyrics has been updated with exciting new features. OSD Lyrics shows lyrics for currently playing song in Karaoke style on your desktop and is compatible with various media players. OSD Lyrics can download lyrics from the network automatically and saves them for any future playbacks. Now try to launch OSD-Lyrics, but nothing will happen. OSD-Lyrics automatically looks for currently running music players and if no music player is found, it won't launch. This can be easily configured from settings. First launch any of the compatible music players and then run OSD Lyrics from menu. Go to preferences and set auto launch to your favorite music player. 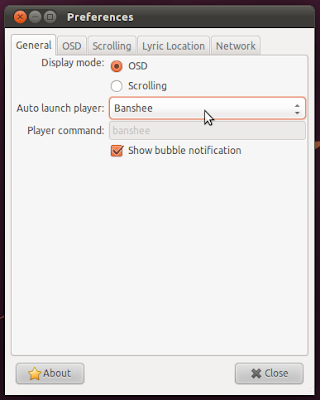 Now onwards, you just need to launch OSD-Lyrics from the menu and the music player will load automatically. Just play any song from your library and immediately you will be asked to select lyrics you want to load. The online lyrics database is quite large and have lyrics for most of the popular songs. 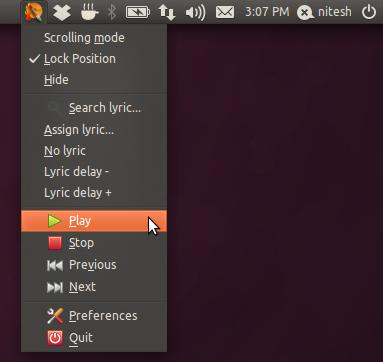 OSD-Lyrics comes with its own appindicator for Ubuntu and you can easily control the music playback and lyric delay from it.